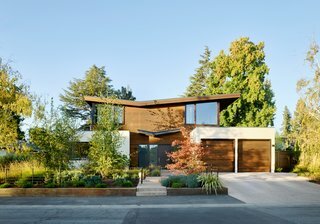 For this Silicon Valley residence belonging to a couple of mixed heritage, William Duff Architects (WDA) drew elements from their childhood homes in Ireland and India, respectively. 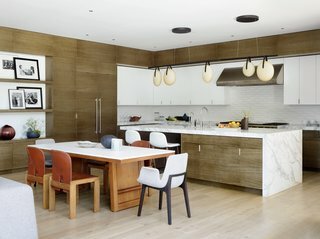 In addition to wanting to pay homage to their backgrounds, the clients, described as "avid design connoisseurs," asked for a sanctuary space for their family of four—where they could unwind from their busy tech careers—that would also be flexible enough to host large gatherings. 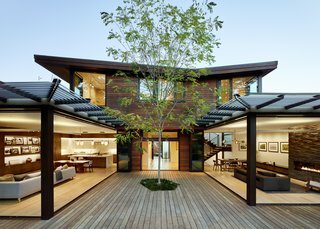 The asymmetrical, Le Corbusier-style butterfly roof gives the home its distinctive form. 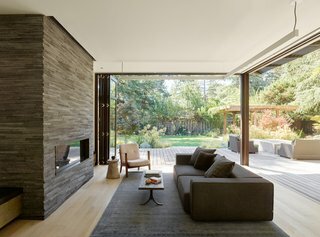 The living room takes advantage of the Californian climate, opening completely to the deck adjoining two indoor/outdoor wings. A coffee table by Buka Design + Hardwoods and a neutral Dellarobia sectional in the living room promote an earthy color and material palette. "When taking the clients’ wish list into consideration, we all agreed it would be better to start from scratch," says William Duff, WDA founder and managing principal. 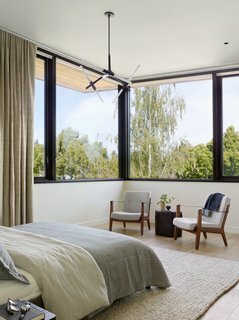 "After many discussions with the client, we decided to demo the former home—an unremarkable 1950s tract home—instead of trying to reconfigure it." The formulaic abode was demolished to make room for a two-story, 4,898-square-foot oasis with five bedrooms and four-and-a-half-baths. 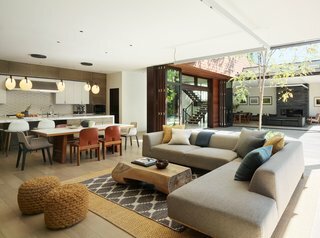 There’s also copious space for entertaining, formal and informal living spaces, an expansive courtyard for an indoor/outdoor connection, a chef’s kitchen and wine cellar, and a media room. Topping it off is an asymmetrical, Le Corbusier-style butterfly roof that gives the home its distinctive form while creating soaring spaces on the second floor. The formal dining area pairs a custom table by Heerenhuis Manufactuur with vintage Danish midcentury chairs. 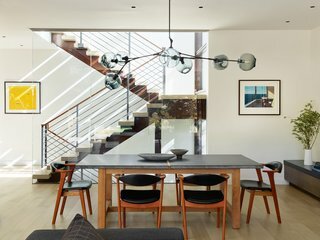 A Branching Chandelier by Lindsey Adelman in oil rubbed bronze with gray, glass globes hangs above the scene. 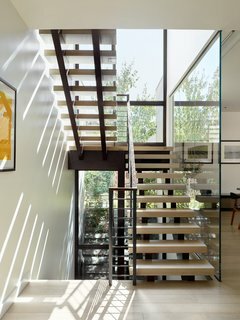 An open, central stair located next to a floor-to-ceiling glass wall offers another moment of connection with the outdoors. A generously sized chef's kitchen fits seamlessly with the contemporary lines of the home. A Rich Brilliant Willing Gala light is suspended above a Pietra Fina island. The backsplash features Heath Diamond tiles in Chalk-2. The dining table comprises a McGuire Furniture Company walnut base with a Staron top, and is surrounded by vintage Cassina and Poliform Ventura chairs. Accordion doors open up to join interior and exterior spaces. Inside, the Andy Sofa by B&B Italia and Capo lounge chair by Neri & Hu for De La Espada offer cozy seating beside the Island Stone Temple Lava fireplace. An Imari rug by Restoration Hardware and a vintage coffee table ground the room. A standalone soaking tub by MTI Baths offers respite at the end of a long day. Adding to the zen-like ambiance are Tatami Wheat limestone flooring and Sea Grass Antique limestone counters, both by Walker Zanger. 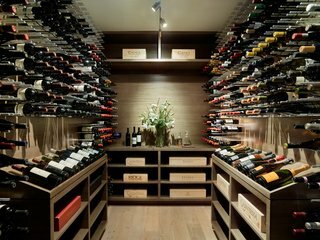 A wine cellar keeps the couple’s bottle collection cool. The airy second floor of the home opens up to treetops all around. Capo lounge chairs by Neri & Hu for De La Espada provide extra seating, while a Restoration Hardware rug and a Lindsey Adelman chandelier tie the room together. The main courtyard design is reminiscent of the wife’s home in India, where the central outdoor space was a gathering area for loved ones. A tree and fire pit on the axis with the main entry, in turn, anchor the courtyard. 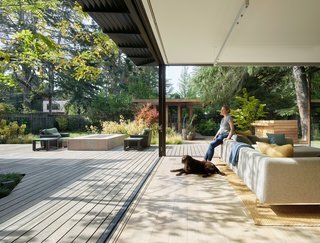 Flanking the garden are the entry gallery, family room, and living room, all clad in accordion glass doors. 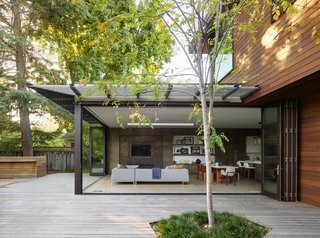 To allow the spaces to flow into each other—and for the courtyard to be a hub of activity—the ipe wood decking was installed at nearly the same level as the adjacent interior floors. Blurring the lines between indoors and outdoors, the H-shaped plan melds the individual spaces into one fluid zone. 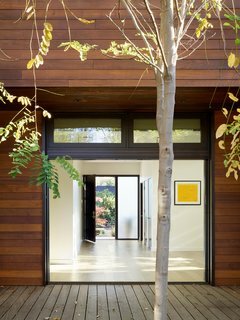 A single tree in the courtyard anchors the central space surrounded by Southland Windows & Doors glass walls. The floor plan was specifically designed to allow for acoustic separation without compromising openness. A view into the entry gallery from the courtyard.